There’s no question which of the Edmonton Oilers’ No. 1 overall draft picks has had the most difficult adjustment to the NHL. Nail Yakupov enjoyed an impressive rookie season in 2012-13, scoring 17 times and managing 31 points in just 48 games, but since then has struggled mightily. He’s now in the midst of his third consecutive unsuccessful season, and Oilers general manager Peter Chiarelli faces two unappealing choices: He can either hang on to Yakupov for another season, hoping that he can change the pattern, or he can trade the 22-year-old winger to another NHL team for what is bound to be an unimpressive return. Either way, the current treatment Yakupov is getting from head coach Todd McLellan isn’t helping matters. It’s easy to be overly critical of the coach. McLellan (and any other coach) has to juggle multiple priorities: what’s best for individual players, what wins games, what furthers organizational goals, etc. 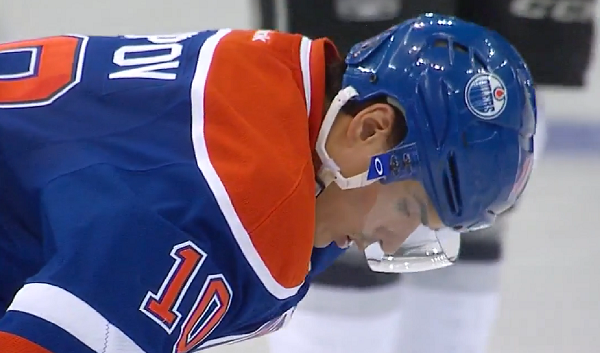 Yakupov hasn’t necessarily made it easy for him, either. But none of that changes the fact that McLellan’s handling of Yakupov has neither put him in a position to succeed nor showcased him for a trade. These are all relatively small samples, though for the latter two centres we can look back on a longer history. Nugent-Hopkins and Yakupov have never worked well together—Dallas Eakins was routinely criticized for not giving Yakupov a fair shake during his time as coach, but he gave that duo a long look and it just didn’t work. In more than six hours together Yakupov had just five assists, no goals at all and the Oilers were caved in on the shot clock. 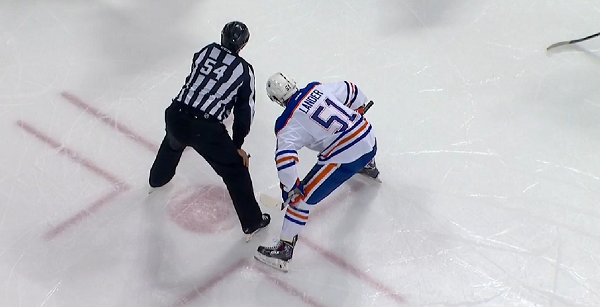 Lander and Yakupov, weirdly, haven’t been a terrible fit in a little over two hours together. It’s not a duo that has produced much offensively, but it has done a decent job of keeping the shots against numbers down. If Yakupov is to be consigned to a bottom-six role, Lander’s probably not a bad centre for him. As for the other two, the results this year have been night and day. With McDavid Yakupov enjoyed some real success early in the year. McLellan took care not to start this line in the defensive end of the rink, but it produced offensively. The Letestu/Yakupov duo, on the other hand, has been totally useless. Sticking Yakupov with an offensive sinkhole like Letestu—his five-on-five points per hour number this year is a little bit north of Nick Schultz and a little bit south of Taylor Chorney—makes it impossible for him to produce. Sticking Letestu with a defensive liability like Yakupov makes it impossible to trust the unit with much in the way of defensive responsibility. If McLellan just wants to shuffle Yakupov to the fourth line and forget about him, maybe the thing to do is to start dressing Lander in the place of the appalling Lauri Korpikoski. That would allow him to build a third line featuring Letestu, Matt Hendricks and Zack Kassian, a unit which could be given some tougher defensive assignments and would at least bring physical play. That would leave Lander and Iiro Pakarinen as a penalty kill duo on the fourth line and allow Yakupov to play his handful of minutes per night with a centre whom he hasn’t been a total disaster with. Alternately, Yakupov could go back to playing with McDavid. The benefits for Yakupov are obvious, as are the benefits to whichever line then gets to play with Jordan Eberle. It’s not at all clear that the Oilers would be worse off in this scenario—whatever loss of effectiveness Eberle suffers is likely to be compensated for by a return to effectiveness for Yakupov—but even if they are it won’t be by much and it’s not like the playoffs are on the line. The caveat here is that if Edmonton is looking at trading Eberle in the summer he should certainly stay welded to McDavid’s hip. Whatever the Oilers think of or plan to do with Yakupov, though, his current assignment next to Letestu seems like a mistake. It’s not good for Yakupov, it’s not good for Letestu and it isn’t good for Edmonton. I think he is as good as gone. Otherwise they would’ve had him in the top six long before now. If they wanted him gone for anything good you would think he would be playing with mcdavid to boost his value. YAK has to be better period!!! It cannot be the coaches fault all the time, onus has to be on him. Injury. He’s not in the long term plans clearly, the least that could have been done was maximize his trade value, which is near zero right now. As much as I like Yak, the best for him right now might be getting a fresh start with another organization. Point well taken that his trade value is virtually non-existent… maybe in a package deal? I’ve been wondering why Letesticle gets so much play on the PP and at evens, aside from his marginal faceoff prowess. Yak has a great shot and one timer when he doesn’t bobble the puck. Seems likely to be a confidence issue more than skill. It would be nice to see Lander start cycling in more with Yak and Iro to see what they could come up with. The suggested 3rd line of Kassian-Letesu-Hendricks should be able to handle the heavy lifting and d-zone starts, and could work wonders to alleviate pressure on a 4th line of Iro-Lander-Yak. The Nuge injury is a real pain in the @ss. We could have seen a number of reasonable combinations, from which PC could make better decisions, about who stays and who goes. I’m sure Kassian isn’t thrilled with Letestu either. After the trade deadline, Yak will get his chance in the top six. Perhaps his last chance. I agree he should be given a shot with a more offensive centerman but Letestu is not an “offensive sinkhole” the way Boyd Gordon or Colin Fraser was. I like him in our bottom 6. On a winning team, bound for the playoffs – Letestu? It’s frustrating to see that management and coaching changes have not improved the team, at all. Lander and Yak have regressed under the new regime after Todd Nelson helped reignite both of their careers last year. Chiarelli failed to address the defence. He overpaid dearly for a future 3rd pairing guy in Reinhart, especially considering how many left defensemen we already have on the roster. The Korpikoski trade deserves an F. The Letestu acquisition has been very underwhelming. Depending on Jultz and marginal players like Gryba and Fayne to carry the right D was bound to fail. Sekera, Kassian and Talbot were good acquisitions but it hasn’t been enough to turn the team around. Chiarelli needs to do much better this offseason. I liked the game Todd Nelson had the boys playing, such a breath of fresh air after the complete and utter Eakins disaster, and would have liked to see how Julian could have progressed with the addition of a game changer like McDavid and some (at least) league average goaltending. There is something to a coach that has the ability to get the most out of his players, it is one intangible that tips the scales in favour of success. Nelson was able to do that, and after all the hype have not seen evidence of same from TMac. Have you seen this team firing on all cylinders yet? How many games can you say they outworked the other team? Too many players underperforming, team not showing up until the game is half over, same lame sound bytes after one goal losses. Nelson even found a way to have Yak contributing paired with a rental the likes of Derek Roy. 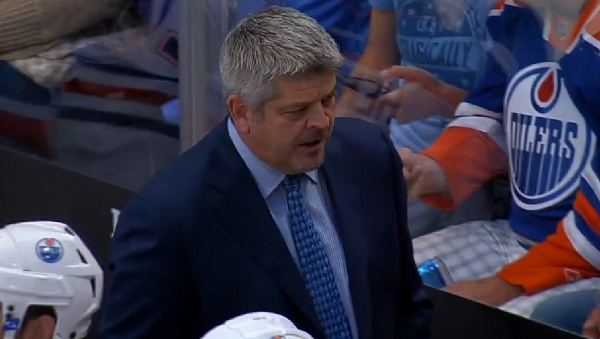 McLellan is here for awhile, I get that, but he better start getting the job done. It’s not all on the players. Yes, it is on the damn players. They get paid big money to play a f,ing game. Quit blaming everybody but the players. That’s getting really old. My heart goes out to Yakupov. The Oilers organization has basically destroyed his career. Sending anyone off who was able to get Yakupov going in the right direction. Or never having depth at center or quality nhl players to play along side. Roy whom I’d have on this team way more than Letestu! I hope Yakupov gets his opportunity in another nhl city. His confidence has been shattered being an Oiler. Sad reality. I agree 100% agree with Willis. Somehow, I guess, Yakupov forgot how to score after getting drafted consensus number one overall based on his offensive output, not his defensive prowess. He was even in the running for rookie of the year. He also played very well with McDavid this year. He has never been put in a position to succeed except for very brief stints. Some argue that he does not deserve top 6 minutes but this does not seem to apply to Mclellan’s favorites- Eberle, Pouliot, Purcell. Night in and night out McLellan is not fielding the best lineup possible to win. Last I checked the Oilers are once again in the bottom 8 in scoring with a pathetic PP on this supposed “juggernaut” of offensive talent. Why not let Yakupov have top 6 minutes and PP time as they have been out the playoffs for well over a month now? What do the Oilers have to lose at this point? Yakupov is a likeable player and I wish him no ill will. Having said this I do not believe he is an NHL caliber sniper as about half of ON seems to think. I am unable to identify an NHL level skill which he possesses. He is a mediocre skater, he has an inaccurate and inconsistent shot/one timer, he is defensively mediocre, he is not a sniper because he can’t score, he is not a playmaker and he does not read the game well at all. He would appear to have 1 year of experience four times instead of four years experience. This would be a case of addition by subtraction. Get whatever you can for him and move on. Actually his individual skills aren’t too bad. He is actually a pretty good skater someone said he was a fraction of a second behind halls time for fastest skater ?. Hard shot . World juniors he was always an amazing playmaker. He just hasn’t put it all together yet. He may not ever .but he def has nhl level skills. Yakupov is so bloody high maintenance it makes me sick. Het rid of him already. You think that it’s 100% the coaches choice to play Korpikoski? On Oilers Now earlier today, Stauffer was saying how Chiarelli and Todd Mac were always together discussing things. Korpikoski is a Chiarelli move. He is getting a chance to prove Chia right even at the cost of anchoring everyone else around him, Yakupov included. Eberle will be gone in the off season. All his minutes til the end of the season are to boost his trade value. After all even a fire hydrant could score 60 with McDavid. I have found Letestu to be a huge dissapointment. I was hoping for a strong, aggressive 3rd or 4th liner who could chip in offensively and I find him to be weak on the puck and almost Belanger esc. I don’t get why McLellan likes him so much, he doesn’t even win key draws. Thanks for bringing this up… I agree with all your points here. This guy drives me nuts, when I see him on the power play. His next face off win on the power play , will be his first.Usless,on boards, cant win puck battles. In fact most times he turns away on the play. Think about it, McDavid is on bench and Letestu is on the power play. All you Yak lovers believe what you want. He is simply not a great hockey player. Hes average. Thats it. Not a fast skater, his shot isnt very accurate nor is he good at getting in position to use it. The linemates argument is non sense. Hes a FIRST overall pick, he should be the one driving the play and making his linemates better, not the other way around. His hockey sense is also poor. Yak does work hard and has a good attitude. He is a fast skater. Results of the skills comp fastest skater contest. Unless you’re calling hall slow yak is pretty fast. The strange thing is that I have never, ever seen Yakupov beat an NHL D man to the outside whereas I have seen Hall do it on numerous occasions. I think that’s more a mental problem than a speed thing. He never tries to go wide he always does that shuffle side to side thing haha. He has a terrible break on his speed, unless he is trying to crash to the board that he seems to be unable to stop at will. He decelerates a lot earlier than others because he has problem controlling his speed. The Oilers are never lack of speed demons but it is not about how fast that you can go but more of how smooth that you can skate. I do believe that speed is a bit overrated in NHL, the difference between fast and slow skating half of rink length are maybe less than half of a second. It is hard to beat anyone by giving only less than half a second. The difference is that Hall, can skate as fast with or without the puck. Not so with Yak, with his jiggy jiggy [energizer bunny] skating. It more like skittering along. [He only seems to skate that way when he is stick handling]. Hockey isnt played in laps. When was the last time youve seen Yak use his ‘speed’ to blow past a defender, or jump on a loose puck and turn the jets on for a breakaway? The game is played in short fast bursts, which is where his speed is lacking. Lets also say ill change my tune and concede he has speed, now then why isnt he a good hockey player? If he has a great shot, great speed, then why is he so inept at generating any offence by himself? If hes faster than i think, then maybe his hockey iq is also worse than i think. Well you could just read my other comments where I said his skills alone aren’t bad and he just hasn’t put it together and that it’s prob a mental problem….. but calling him slow is a lie. And almost no player generates offence without playing with other good players. Yak has produced when he has been put with decent players. Hall was a first-overall pick. He played with Letestu but hasn’t scored, as far as I recall. At the very least, his ppg has dropped off with Letestu. He is not making Letestu better. Should trade Hall, I guess. Two other things: in the last ten years, Yak is the lowest scoring #1OV (except defencemen). So a lot of people hold that against him. In his favor, he has produced with offensive centres. He scored his rookie year, last year with Roy,, and in the handful of games with McDavid. He has not scored with bottom-6 centres, but who in the last ten years who has? Well Said Ivan!! It is interesting Oiler Fans who want Yak moved forget how he has been treated by the Oiler Organization!! Key point Eberle , Hall and Nugent Hopkins have never done well with bottom 6 forwards and have been sheltered from playing with bottom 6 forwards. This luxury has not been warranted to Yak! I make it clear Eberle Hall and Nugent Hopkins careers would begin to tank if they were playing with Letesu!! Put Yak back in the top 6 or trade him for what you could get for him because of how the Oiler Organization has handled him… A BAG OF PUCKS!! Maybe it is just me but I still believe that it is a Russian thing. Think how many times that Ovechkin has been criticized by Canadian media and Don Cherry criticized him all the time too. Even for Galchenyuk who is born American that Habs still prefer an undersized (he is even smaller than Gaudreau), limited talent (never drafted as a Canadian), with not much of the offense (never scored 20 goals and only 2 seasons with 50+ points) as their No.1 C in Desharnais and Habs are wondering why they sucked at scoring. Canadian medias are always biased toward Russian born players and it influences fans to react the same way. Here is a question I’m wondering about, has Yak ever played on first line or ever played for more than 20 minutes in ANY game? Well, you can claim because it was the reason of McDavid but…Yak’s first 12 games have 10 points and avg icetime of 16.5 mins. The next 25 games have 2 points with avg icetime of 12.3 mins this year. And if we look back into Yak’s career numbers, Yak has a whopping total of 21 games out of his 227 games played over 18 minutes. And for those 21 games that Yak has scored at least a point in 12 of them with 9 goals and 8 assists and a total of 17 points. Does that sound anywhere close to be an top NHL numbers? If true than yes they would make him a 1st lime RW. There was an article a few weeks ago that should he scores at a second line rate. Pretty good for a guy playing his career with mostly third and 4th line plugs. I’ll let Petr Klima explain Yaks problem. “I’d need a long stick to score from the bench.”—Petr Klima. Anybody who is still a yak supporter has had there eyes welded shut. And yes I was on the draft Yak bandwagon, I was the main cheerleader…but what I didn’t realize at the time is he is completely void of any hockey sense…he is hockey stupid and you can’t and won’t fix it! Yak is still only 22 years old and has a great skill set. Given time to develop those skills within a good system under quality coaching should yield a high quality player. Playing him with a gifted center who can constantly set him up has already worked with McDavid. His contract is cap friendly… his trade value is low… geez, maybe we should keep him? Guess what it didnt actually work from a goal scoring perspective. McDavid only set him up once, Hall the other one in those first 13 games. However for some reason Yak was able to get some good assists and his overall play was better. I like Yak, but he is too erratic and hard to set up because hes never in the right place. Honestly I have to tell what’s wrong with the team this year. No matter what the nation thinks, Yak is not a Chirelli type player. Brad Marchand scores, hits, agitates, forechecks relentlessly, backchecks and has excellent hockey IQ. He is the same size as Yak and wasn’t drafted first overall. That is a Chirelli type smaller player. I still believe that Katz over ruled the scouts as they wanted Murray. Four years later, hindsight proves the scouts correct. Tough to take for you Yak apologists eh? Murray hasn’t done much of anything so not that big of a letdown. Plays left side anyways. Marchant doesn’t play on the 4th line with slug at center. That’s the whole point. Take any of the top10 players in the league and put them on the 4th line and lets see how many points they get at the end of the year. It’s almost like the team is doing its best to make sure Yak has a terrible season. When Yak is traded for nothing it will be interesting to see what this player does. If they don’t trade ,he will go back home and the team will get 0 for a first over all plyer. Another first by this team. It makes zero sense to put Yak back with McDavid. From a team perspective your number one priority is to maximize the offensive output of your most talented player. There is no question that McDavid’s production is best served with Eberle. 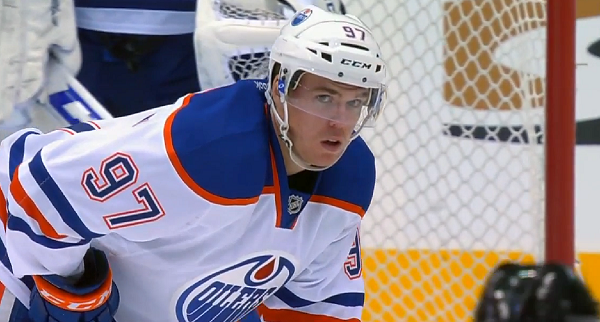 Over the course of a season Yak with McDavid scores 20 goals. Eberle scores 40. That isn’t a small difference. Prior to Connor’s injury you could already see teams giving all the time and space in the world to Yakupov and essentially double teaming Connor because the league knows that Nail isn’t likely to score even with a lane to the net. Having Eberle on his wing keeps teams honest. They need to focus on McDavid but if they go to sleep on Eberle he can hurt you. So Yakupov will certainly look better with McDavid but if it forces Connor to work much harder and fight through tighter checking then it’s a negative for the team overall. McLellan know this and that’s why he doesn’t do it. That’s why it’s nice having Todd as coach this year. Fans know that he is an experienced, accomplished pro who knows way more about the game then we ever will. So if he thinks Yak needs to be hidden on the fourth line then that’s where he belongs. For any of us to speculate otherwise just shows our personal pre existing bias. It makes sense if you wanna trade yak. Season is over anyways may as well play whatever right winger you wanna trade with mcdavid. Coppernblue had a thread questioning if the oilers are pumping and dumping Eberle already. Given that we’ve seen McDavid play all of 20 games, I think it’s a little early to claim that over an 82-game season he would score 40 with Eberle and only 20 with Yakupov. I thought I was being a little optimistic suggesting Yak could score 20. McLellan obviously feels like Yak is an anchor on every line he goes to so he might as well weigh down the line that plays 8 minutes a game. I also think the Oilers feel like Eberle’s trade value can be helped by playing him with McDavid and no teams in the NHL are going to be convinced Yak is a player just because he produced on a line with McDavid. Whatever yak does with Connor will be attributed 100% to McDavid by GM’s. There’s no way for me to confirm this obviously, but has anyone stopped to think that maybe, just maybe, the reason that Yakupov got to play with McDavid in the first place was because Eberle was hurt at the time? I wanted Ryan Murray. A lot, and I mean A LOT, of people disagreed because Yak was the best choice. Now, Murray hasn’t exactly lit it on fire so far either, but I’d rather have Murray with Klefbom right about now. I’ve cheered for Yak and will continue to do so, but the kid needs a fresh start. I really think Yak ought to play on big ice in the KHL. His skill set and the way he plays, is suited for it. Big ice would give him more time and space to operate and to see the game at a slightly slower pace. NHL ice – forces much quicker thought processes, due to the confined space. What about Tak with Hall and Drai? He isn’t worse than Purcell and he might complement well with Leon. I think it’s worth the experiment, Purcell is a goner soon anyways. Yakupov needs to hang tight. A spot is about to open up when Purcell gets traded. If Purcell is trade bait, it’s time Yak plays with a more experienced Draisaitl (as compared to Drai last season). He had a good amount of success with Derek Roy. Roy isn’t a top 6 center, nor is he a superstar. Much must be said about line chemistry. Much must be said about the fact that Yakupov doesn’t need an ace center to perform well. I’ve written a long post that criticized Yak’s game a couple months back, so I won’t go over all that again. But I see a lot of talk of “hockey IQ” is being misused (and misunderstood), and I’m seeing a lot of misunderstanding in how much blame can be put on the player versus his development. In Yak’s case the fault largely lies with the team. Yakupov already has the hardest part that cannot be taught, athletic skill. He has to be molded, moreso than players like Nugent-Hopkins, who made it into the league highly ranked based on his hockey sense. As such he should have been seen as a project from day one. Not having him play in the AHL with Hall, Ebs, Nuge, and Schultz was a missed opportunity. Here’s the thing: the Oilers, as an organization, weren’t great at player development. A couple of Oilers players took it upon themselves to improve aspects of their game. Purcell and Draisaitl have worked on weaknesses and have more than compensated for them. I truly believe that a guy like Adam Oates can mold Yakupov’s talent into an effective top 6 forward. He needs to hear this from the team and his agent. From his perspective, he probably doesn’t know what the issue is, the team needs to hold his hand for a bit for a large payoff, it’s the least they can do to compensate for mismanaging him thus far.